They always have to scrape it first, before they make it soft. Sometimes they would wet the skins and work them with their hands to make them soft. 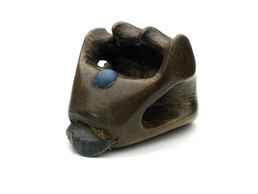 This wooden scraper has a stone blade and is carved to mold perfectly into the hand. To prepare animal skins for making clothing, women used scrapers to clean away flesh, fat, and hair, and after drying the hides, to soften them by breaking down their fibers. Skins were further worked by hand using water and fish eggs to make them soft.